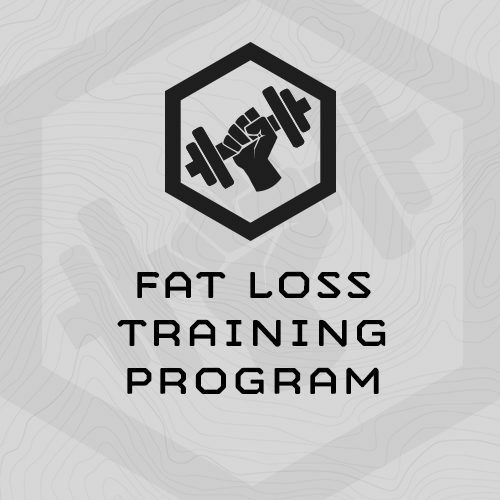 The following is a 6-week program designed specifically to help athletes lose fat through training. For the best results we recommend you pair this training plan with a disciplined diet. This does not mean you have to be overly restrictive, just smart and committed. As a general rule of thumb, fat-loss is approximately 80% diet and 20% exercise. This training plan covers 6-weeks of fat-loss exercise progressions and can be repeated or used as preparation for more intense training programs. However, since a good portion of the overall success of any fat-loss plan is diet this plan will also provide you with tips and resources to assist with your diet. Overall, the training for this program has a sharp focus on aerobic conditioning, work capacity circuits, and total-body muscular endurance. Training is designed in a Monday – Saturday format (6 days on, 1 day off). Each week you will have five prescribed training sessions (three strength based, one interval based run and one endurance run). You also have four 30-minute jog or walk sessions in the evenings. That makes nine total training sessions per week. Don’t be overwhelmed by the schedule – take the training sessions one at a time. Most sessions take between 40-50 minutes and can be combined with the 30-minute jog or walk sessions if that works best for your schedule. This program gets progressively harder each week. Follow the program as close as possible. However, if you are unable to follow this format, that is fine. Simply do the workouts on the available days of the week without skipping workouts. How long should the training sessions take? Each session should take around 30-60 minutes. Unless indicated, the circuits aren’t “for time.” Work briskly, not frantically, through the sessions. What equipment do I need for this plan? (4) Max reps 40 ft. Shuttles in 3 min. (5) Run 1.5 miles for time. (1) Jog/Walk for 30 minutes @ easy pace - no structured pace, just move continuously for 30 minutes. Enter your SESSION 1,1.5-mile assessment time into the website Run Interval Calculator to determine today’s 800m interval pace. (1) Run 40 minutes @ Easy pace. Enter your SESSION 1 1.5-mile assessment time into the website Run Interval Calculator to determine today’s easy run pace. If you are not able to run for a full 40 mins. then divide your run into run/walk intervals. For example: Run 5 mins. and walk 3 mins. - for 40 mins. "After following your Fat Loss program and losing 21 lbs. I am just finishing week 1 of Peak Bagger and it is hard but awesome. The step ups and leg work are just what I need to attempt a Grand Canyon R2R2R hike this year. After following your site for many years and cobbling together my own routines, I jumped in on your programming. Needless to say, your programming is just what I needed. After laying down a hiking mileage base, the Peak Bagger program is going to help add the strength needed for the altitude loss and gain I will experience in the Canyon. If the 1st week is any indication, I should be ready for my next adventure. Thank you for the workouts! Definitely money well spent."